3D TLC NAND, achieving a $1/GB price point (usable). Native data asynchronous replication, based on snapshots. A feature called “Perpetual Array” to take some of the operational and financial cost out of in-place upgrades. Let’s look at each of these items in detail. Firstly, following on from the use of 3D TLC NAND seen by Dell, Kaminario becomes (to my knowledge) the first bespoke all-flash vendor to implement 3D-TLC technology. Chris Mellor over at The Register assumes the drives to be the PM1633 model already in use by Dell. These (currently) scale to slightly under 2TB, with 4TB drives on the horizon (in fact these numbers are slightly rounded, 2TB is 1.92TB, 4TB is 3.84TB, but you get the idea). In a presentation to me earlier this year, Micron detailed the rapid rise in adoption of 3D-TLC in the enterprise. 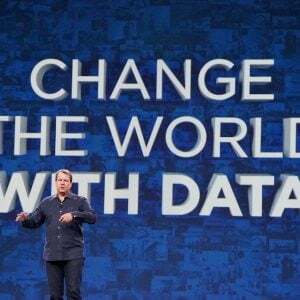 We can expect drives from Micron and Intel within the next 12-18 months. As an additional guide, a recent post from Jim Handy (The Memory Guy) relating to discussions at the recent Flash Memory Summit indicates that 3D-NAND technology may not be limited by the number of layers that can be laid down on a single chip. This represents the possibility of seeing NAND flash survive much longer in the market than we expect and for capacities to increase significantly. This is the same evolution we saw in disk drives – every potential technical hurdle gets overcome one way or another. 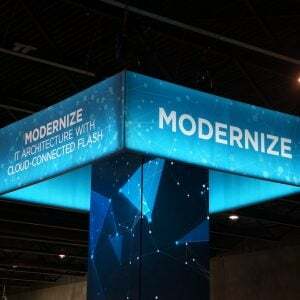 All-flash arrays have matured and moved on and the differentiators between vendors are no longer just about high performance and low latency. Price is back on the agenda (and likely was never off) as all-flash moves into position as a viable replacement for the majority of spinning disk media in the data centre. Kaminario’s early adoption positions the company well to be a de-facto replacement for the likes of EMC VMAX as those arrays reach end of life and are replaced. Data replication for Kaminario is really a catch-up feature that many vendors (such as HP 3PAR) already offer. Replication is currently asynchronous and based on snapshots, with integration for VMware SRM. Replication traffic is reduced through compression and WAN optimisation technologies. Probably the most significant benefit to mention here is that Kaminario aren’t charging for replication. HP 3PAR StoreServ replication is a licensable feature; EMC XtremIO requires additional hardware and software in the form of RecoverPoint (note that some other vendors don’t charge for software features and do include them within the platform price). Over the last 15 years, external shared storage arrays have seen massive growth in the enterprise. One issue that comes up time and again is the cost of migration from one monolithic platform to another. The answer to this problem is of course “scale-out” rather than “scale-up” as scale-up arrays eventually reach a point where either they can’t be increased in capacity/performance or the risk factor of having so much storage in a single “fault domain” is considered too great. Scale-out technology is a good solution but still requires that the technology and economics work; from the technology perspective, a scale out cluster should allow the use of unlike nodes, removing the restriction from using new capacity hardware (as is the case with K2, which supports scale-out and scale-up). Economically there needs to be some incentive to refresh or retain hardware on maintenance. The economic features of Perpetual Array have yet to be fully detailed, but hopefully we will see more information on this in the coming weeks. It’s interesting that Kaminario has chosen to call this release 5.5 rather than 6.0, however this does make sense as the changes are more incremental than fundamental. We’re seeing a shift in the all-flash market to one where flash is becoming financially viable for all primary storage requirements. Previously, high-intensity workloads would have been moved to flash and the general applications left on spinning media, simply because cost couldn’t justify the use of flash everywhere. However general workloads don’t have the highest level of I/O density (IOPS/GB), so can use lower endurance technologies like TLC, where DPWD (device writes per day) are in the single digits. Of course not all architectures can use lower endurance flash – check out this analysis from Dave Wright of SolidFire, talking at a Tech Field Day event last year. It’s the last video “Comparing Modern-All-Flash Architectures”; start from 33:25 into the video for details on flash drive management. The evolution to general-purpose use of all-flash devices is where the market is headed and is likely where the next shakeout of vendors will occur. With hybrid companies moving into the all-flash market, things are only going to get tougher. Kaminario looks well positioned to compete. Disclosure: Kaminario is a client of Langton Blue Ltd.